Frances “Fanny” Parker was a British suffragette who became a prominent militant. She was born and brought up in New Zealand. She was Lord Kitchener’s niece and he paid for her to come to the UK and study at Cambridge University. After graduating she taught for a while in France and New Zealand and, on returning to England, began campaigning for women’s rights, first with the Scottish Universities Women’s Suffrage Union and later with the militant Women’s Social & Political Union (WSPU). Fanny was imprisoned on many occasions for causing damage to property and was arrested for being part of a deputation from the Women’s Parliament to the House of Commons, receiving a six month prison sentence on that occasion. After taking part in the window-smashing campaign promoted by WSPU Fanny was arrested and sentenced to four months in Holloway Prison. It was on that demonstration that Fanny met fellow suffragist Ethel Moorhead, and the pair became lifelong friends. In common with many suffragettes, Fanny went on hunger strike and was subjected to force-feeding. Later that year she was imprisoned twice, once for breaking windows, and once for breaking into The Music Hall in Aberdeen with the intention of disrupting an appearance by David Lloyd George. By August 1913 Fanny was WSPU organiser in Edinburgh, and spent some time looking after Ethel, who had been released from prison under the ‘Cat & Mouse Act’. This Act allowed women prisoners to be released from prison when their health had deteriorated such that their life was in danger, but re-arrested as soon as they got better. In 1914, with WSPU activism becoming increasingly militant, Fanny appeared in court in Ayr, under the alias Janet Arthur, accused of trying to burn down the Robert Burns Cottage. Fanny was probably assisted by, or was assisting, Ethel who managed to escape. Fanny refused to enter the dock or recognise the court’s jurisdiction, declaring, ‘You Scotsmen used to be proud of Bruce. Now you have taken to torturing women.’ Fanny was committed to Ayr Prison where she went on hunger strike. In Scotland, only Perth Prison force fed women hunger strikers and so Fanny was transferred to Perth. Thanks in part to her influential family, Fanny was eventually released to a nursing home to recuperate, from where she escaped. It is entirely possible that Ethel and Fanny were responsible for burning down the cinemas in Perth and Dundee, incidents that took place on the same night and which were recorded as accidents. World War I broke out before she could be caught and Fanny, along with all suffragettes, was given amnesty. During the war, Fanny served in the Women’s Army Auxiliary Corps and was later awarded an OBE. Fanny died in France and it is thought that she may have been living with Ethel at the time. In any case, she did leave the bulk of her estate to Ethel in her will. I hadn’t heard of Fanny Parker until attending Dr Norman Watson’s ‘Suffragette City’ talk at Perth Museum and Gallery. At the start of his talk Dr Watson asked the audience, women and men, if they thought that they would have been militant suffragists. About 90% of the audience said that they would. Dr Watson went on the describe the nature of the militancy across the UK but particularly in Perth and Dundee and described the horrific nature of force feeding and the casual brutality of the Cat and Mouse Act. At the end of the meeting he posed the question again. This time less than 20% raised their arms. 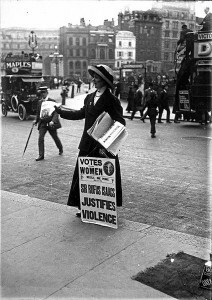 The campaign for women’s suffrage is often displayed as sturdy, dour, rather grand women standing on street corners giving out leaflets. Even Black Friday, where women were attacked by policeman who had been given authority to use every and any means to brutalise the women marchers, was categorised at the time as women knocking the helmets of a few bobbies. The truth is much darker than that. Many of the women who struggled for women’s rights are now forgotten. Women like Fanny Parker.